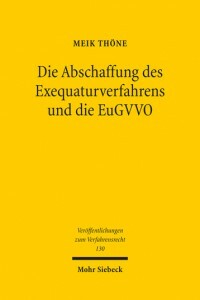 Meik Thöne has authored a book on the abolition of exequatur proceedings under the new Brussels I-Regulation (“Die Abschaffung des Exequaturverfahrens und die EuGVVO”, Mohr Siebeck, 2016, IX + 289 pages). The volume is forthcoming in German. A German abstract is available on the publisher’s website.